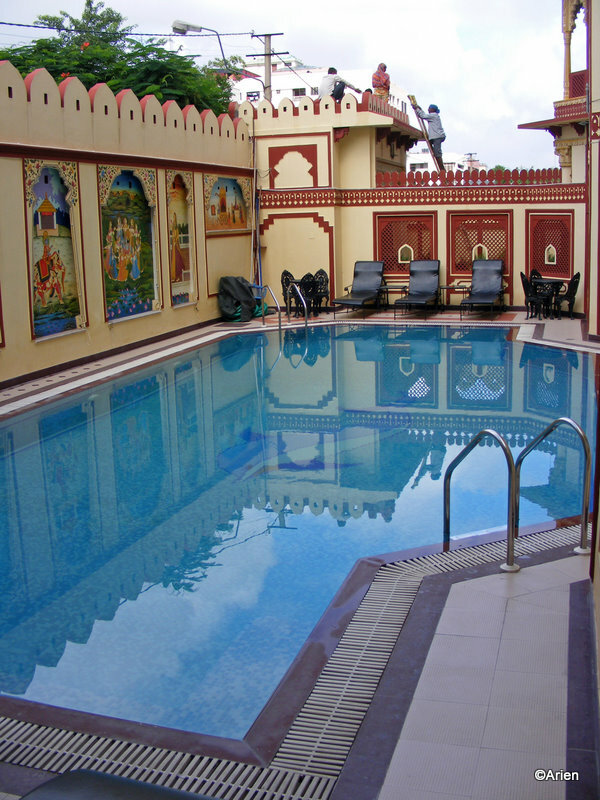 Because we had such a swell time at Jaipur which was largely thanks to the hotel we were staying at, I have decided to dedicate a post to the hotel. The first post has pictures of the room we stayed in @ the hotel. This post is dedicated to the hotel in general. On the day of check out, we spent the morning taking snaps and walking all around the place. 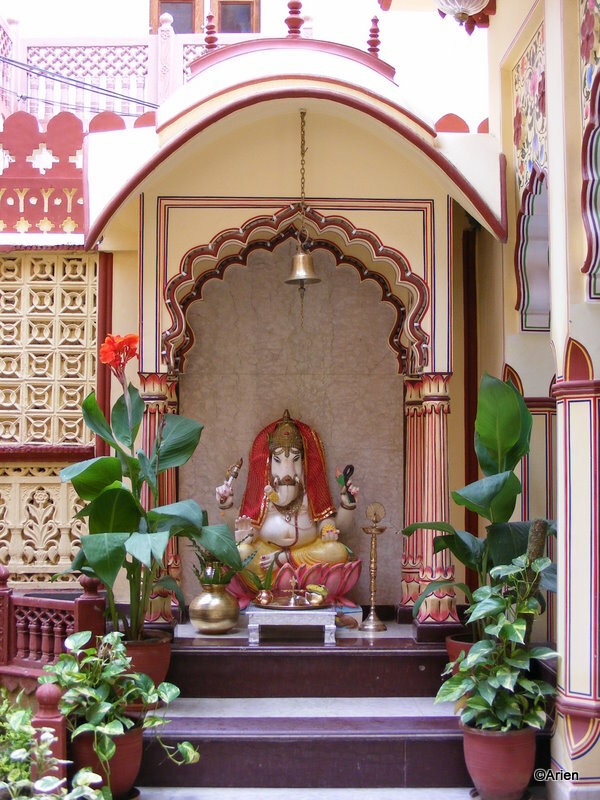 The first spot to get photographed was the Ganesha idol jes outside our room. A puja was in progress and we waited till the pujari left before taking this snap. A puja is performed everyday but we noticed it only today. We must have left for the breakfast buffet at the roof before the puja started which would explain why we missed it. When I had looked out of the window on the day we arrived, I was quite surprised that the windows of our room gave us a view of the swimming pool. That obviously was the second photograph of the day. Some of the hotel folks can be seen in the corner, fixing something. We did not try too hard to get them out of the picture. There was nobody at the pool in the morning which was great. We did not embarrass anyone nor did we get embarrassed 😀 Most foreigners are used to Indians taking snaps of them, with them etc. but naturally we did not want to be clubbed with that group! 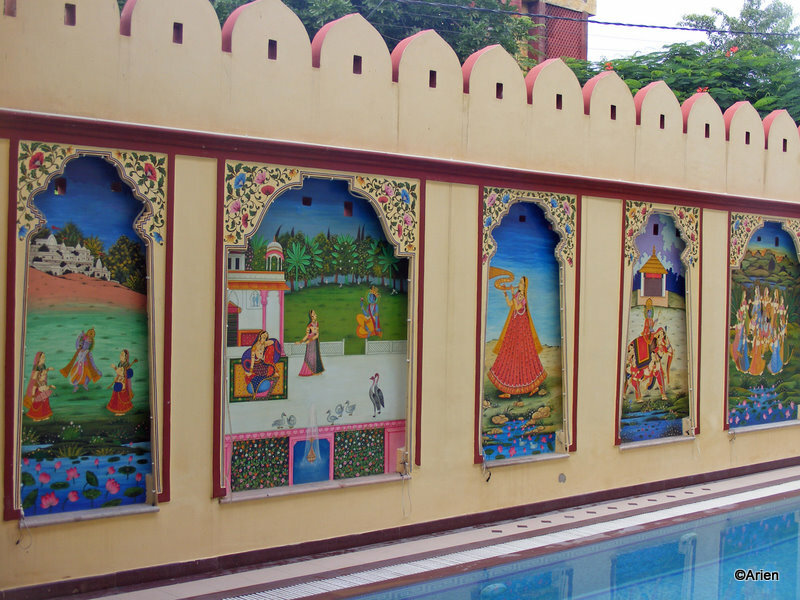 The paintings on the left of the pool were quite colourful and bright – very typical of Rajasthan, I feel. Naturally, I could not resist taking a snap of that as well. The whole place had a lowe for the brilliant copper sulphate blue. Not only was the pool of that colour, most of the painitings used that color to indicate the sky as well as the water bodies. Kinda overkill but looked lovely nevertheless. The common areas had a lot of knick knacks, wall hangings, and comfortable chairs. Though I felt it was quite crowded, we also had an impression of space which was quite odd. On the day of travel, the Arien is usually quite tense. Apart from giving me updates every 5 minutes regarding our packing status, which was non-existant, he also refused to take any more snaps. I promised that after two more snaps, we could get started on the packing. 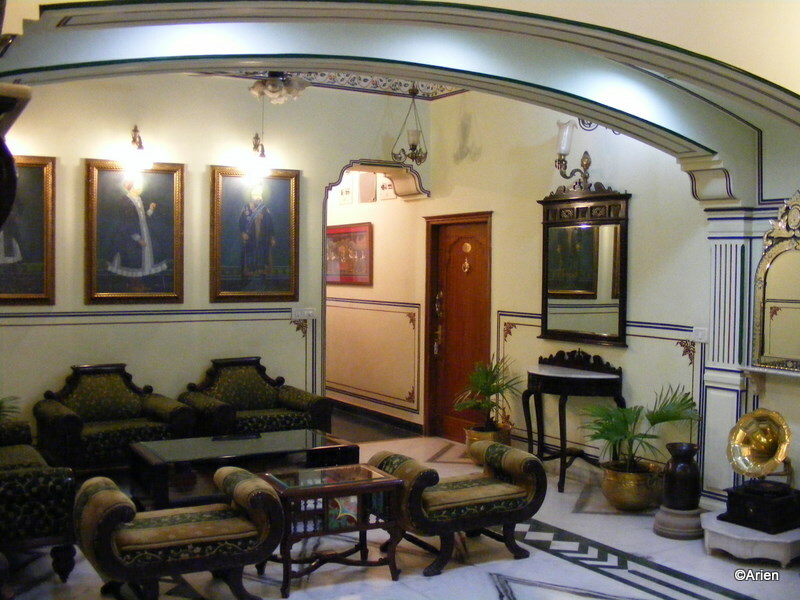 The common area where ppl staying at the hotel could lounge away for hours together was actually a very difficult room to photograph because of the number of mirrors on the wall which made the snaps come out weird. Finally, the Arien managed a decent shot. Notice the show-piece gramaphone in the corner. As we walked further, we came across an open space that had a beautiful door, which was locked. While we were wondering if this was some special place, we were politely informed that yoga classes take place here. It made a lot of sense. It was quite cool and you could focus on the amazing designs on the door as you tried to perform some of the tougher yogasanas. 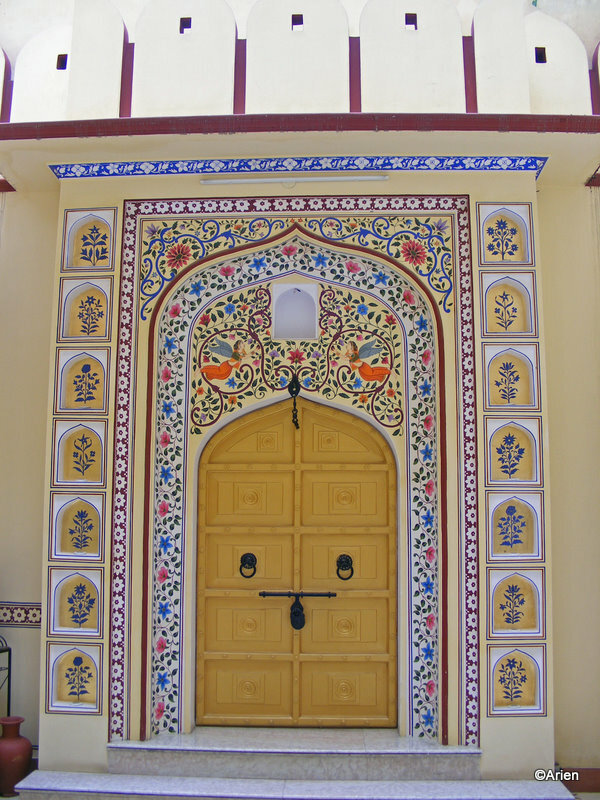 The door reminded me a lot of the Bulund Darwaza that we had visited at Fatehpur Sikri. But, this place was very clean, with a cool breeze. While I was wondering how it was soo cool, I recieved the next update from the Arien and knew that he was right. We were running late and I had not packed yet. This was such a nice vacation. 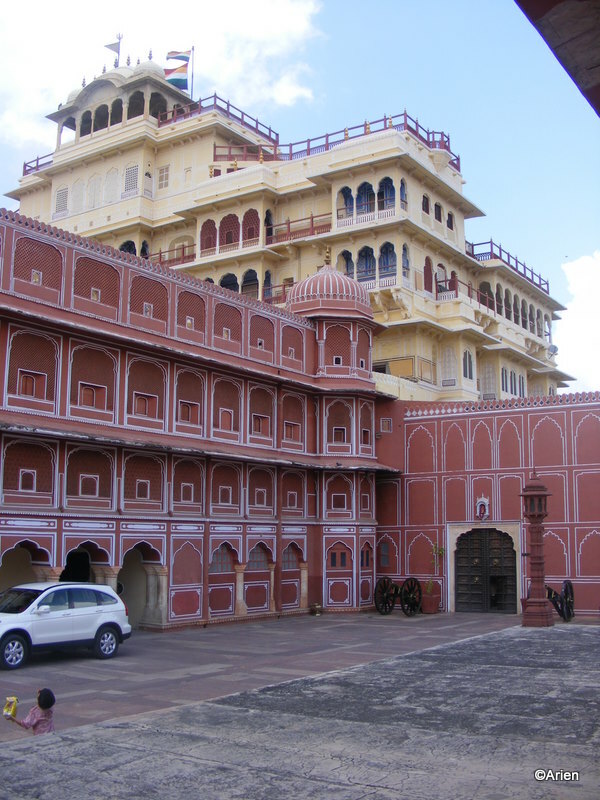 I enjoyed Jaipur more than I enjoyed Delhi. 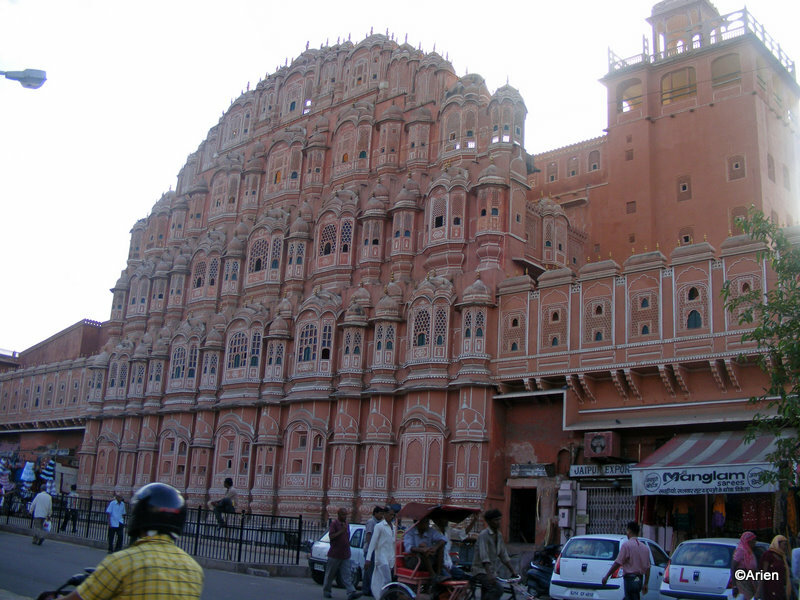 Delhi, with its myriad options failed to impress, but Jaipur impressed big-time. 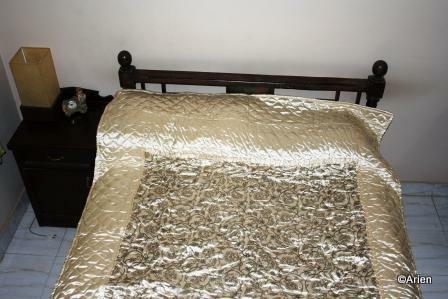 We were unable to make it to Pushkar which was my only grouse. We were returning to Delhi and then going back home. The Arien is writing accounts – I think we overspent as usual – but who cares if you had a great time – right?!! I think so anyway. 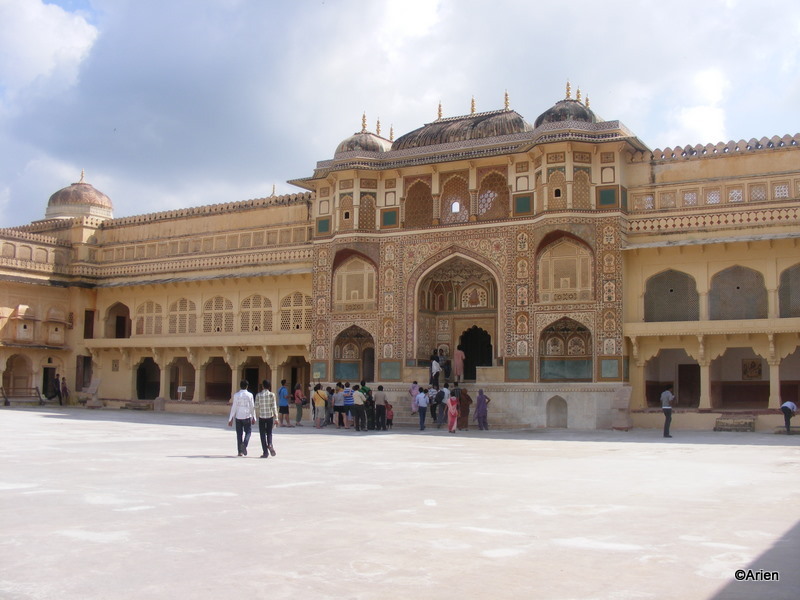 The next place we were going to visit was the Amber Fort (also known as the Amer Fort). This decision was made by the rickshaw driver. Both of us were hungry but we knew that if we took a break now – we would miss the rest of the sight-seeing. That did not appeal to us and so, off we went. I was glad to see that the roads were not very well-maintained. 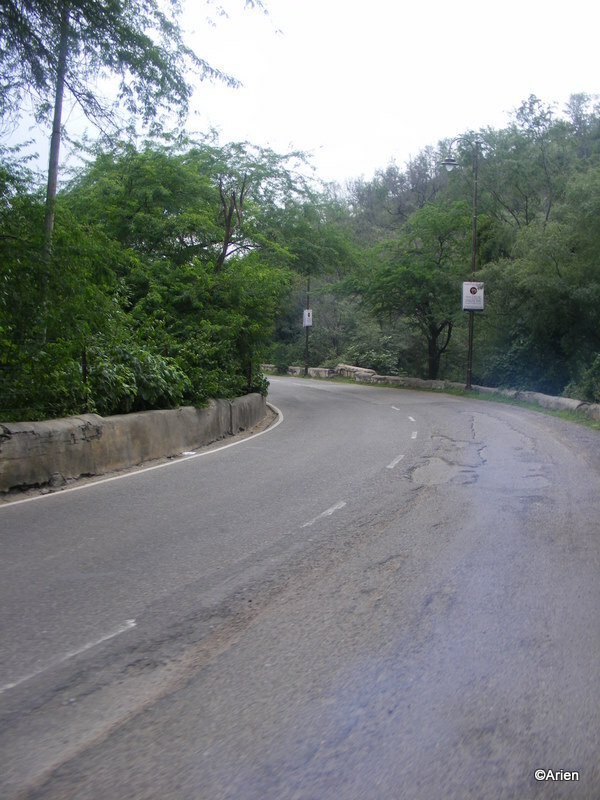 Most of my north Indian friends insist that Northern India is by far well-maintained, great roads etc. Well, I was glad to see that it was not all true! 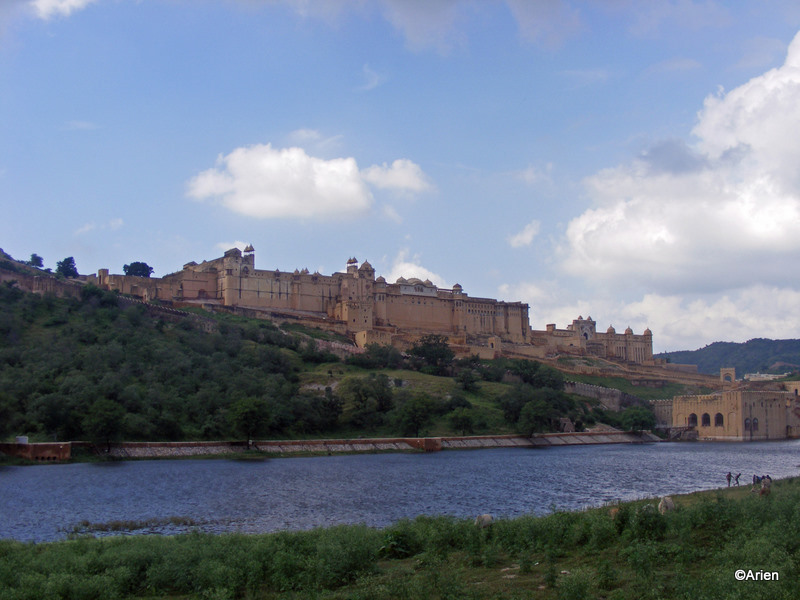 This was our first view of Amer Fort or Amber Fort – it was a warm, sunny day, a little after regular lunch time but the effect was fantastic. We asked the rickshaw wallah to stop so we could enjoy the moment. The sight of the fort overlooking the lake seemed so calm, so soothing. The rickshaw wallah quickly offered to take a snap of us against the background of the fort. 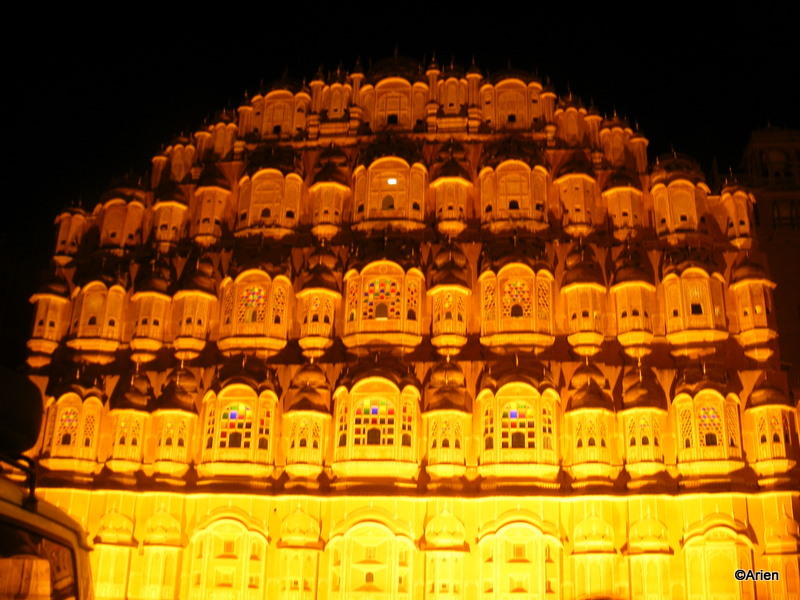 Though it was not a great snap – I will forever remember that moment as we stood staring awe-struck at the beautiful fort. We were now ready to visit it. Instead of taking the regular entrance, our rickshaw wallah took us around the fort to a side-entrance where he parked the rickshaw. He found us a guide and told us that he would wait for us here. The guide was a regular. He was not Dev Anand but he was a pleasant old man and quite serious ’bout his job. 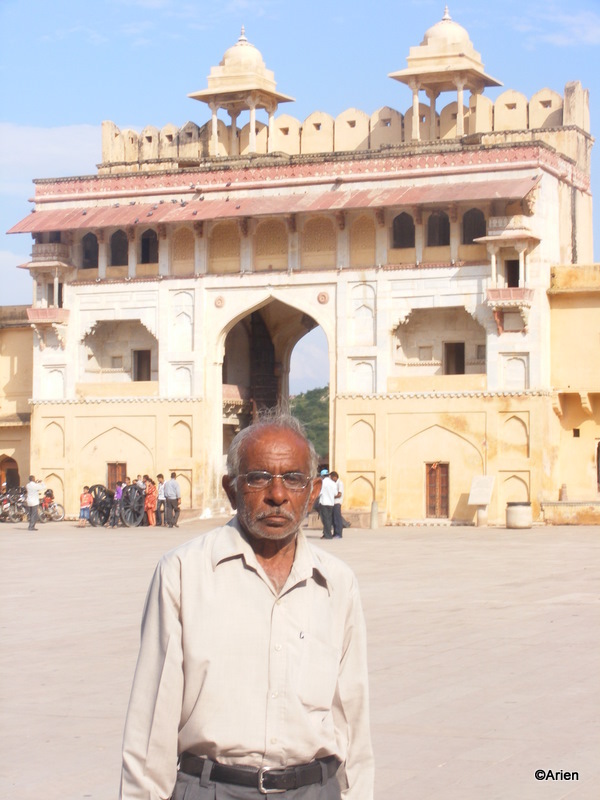 A greater contrast to our guide from Fatehpur Sikri cannot be imagined. We never got to introduce ourselves. He was off full-speed towards the zillion steps that was part of the side entrance. Fitness is a habit was all I could think of after huffing and puffing all the way. I was out of breath and so was the Arien but he pretended he was waiting for me (Isn’t that mean?) at all strategic break areas. A snap of our guide with his favorite serious expression. 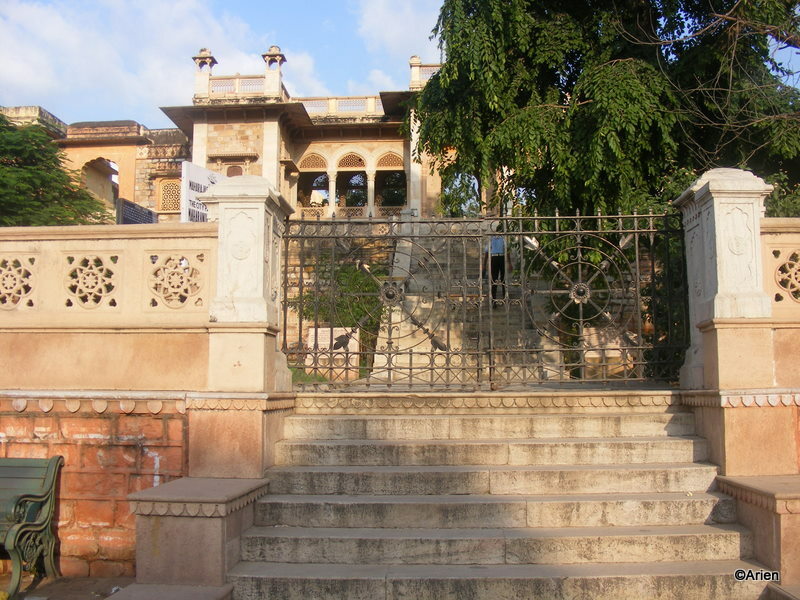 As a result of entering the fort via a side-entrance, we faced the Baradari pavilion first. We had no clue at that time, though. It looked a lot like the Lotus Mahal at Hampi, here. 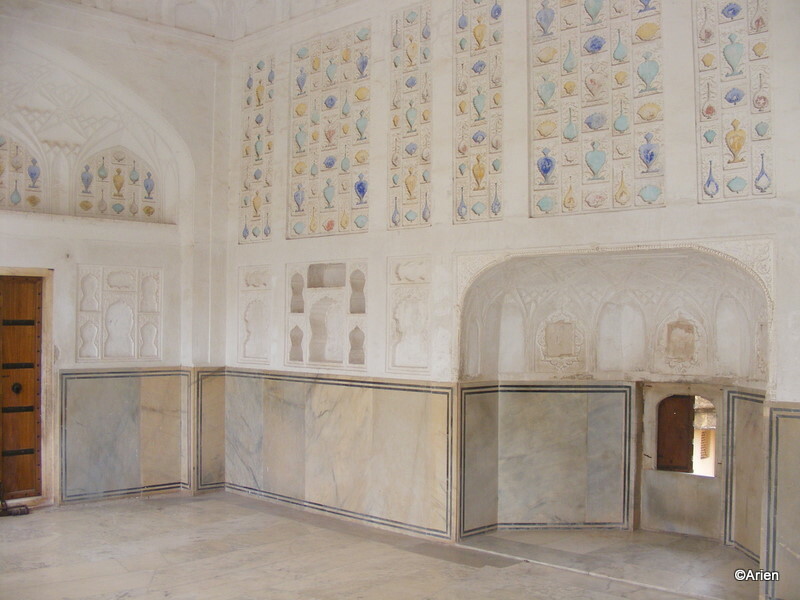 Jes goes to show that there was abundant mughal influence, not just in North India. There was some kind of renovation work going on and so we moved on ahead. We were also asked not to step inside the bharadari. The angle frm which the Arien has taken this snap does not show you the facade on the side. Anyway, we moved on. We saw the Sila Devi temple, where most folks were praying, and did not stop to take pictures. We moved to a grand garden, which had buildings on both sides. It was slightly cooler there and a nice breeze was in the air – I really wanted to spend some time here but the Arien was impatient this time. We were facing the Sheesh mahal. 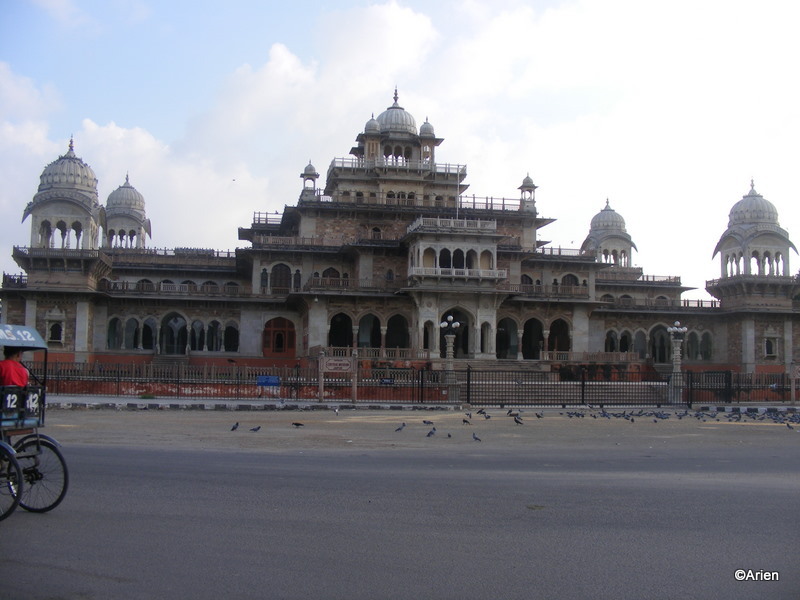 The Arien has taken so many pictures of the Sheesh mahal from various locations and it is quite difficult to identify that the image is of the same building. 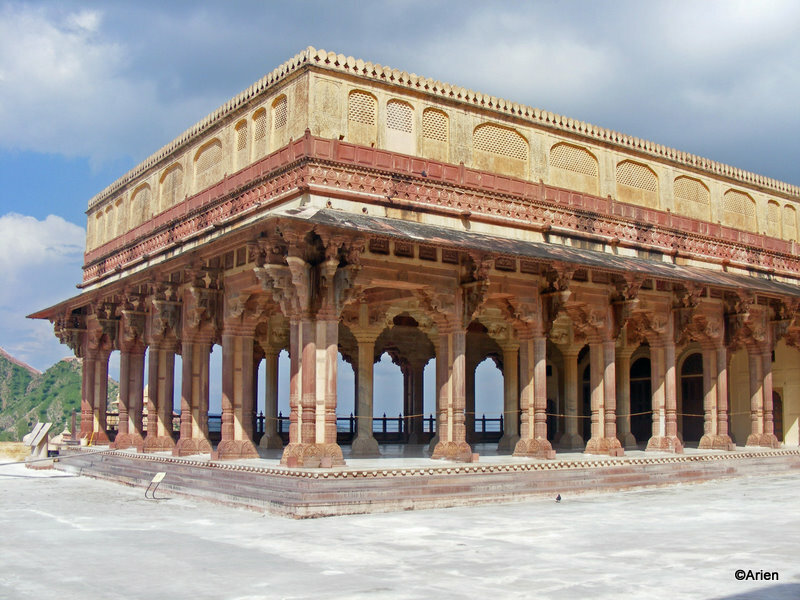 It was beautiful and we walked all around so we could actually spend some time in the Sheesh mahal. The guide pointed to a lot of coloured impressions on the wall and said that it originally contained precious stones and now what is left is only the colour – somehow that did not seem believable. After you see the picture on the left, you will probably feel the same. There was some amount of renovation taking place and we were not allowed to enter certain sections of the Sheesh Mahal. However, tourists being who they are, tried to sneak in, take pictures of themselves against the backdrop of the forbidden section of the Mahal and then were rudely pulled out by the few security guards. It was funny – watching the entire scene play out. The Amber fort itself consisted of various entrances, exits, different routes to the same place. If we did not have the guide, I am sure we would get lost. Also, we would not know which building was important and why. I was really thankful to the rickshaw wallah because of whom we had a guide. After taking about a zillion pictures, the Arien was ready to leave. I was sure that he was hungry by now. It was almost 4 and we were nowhere near a resturant. 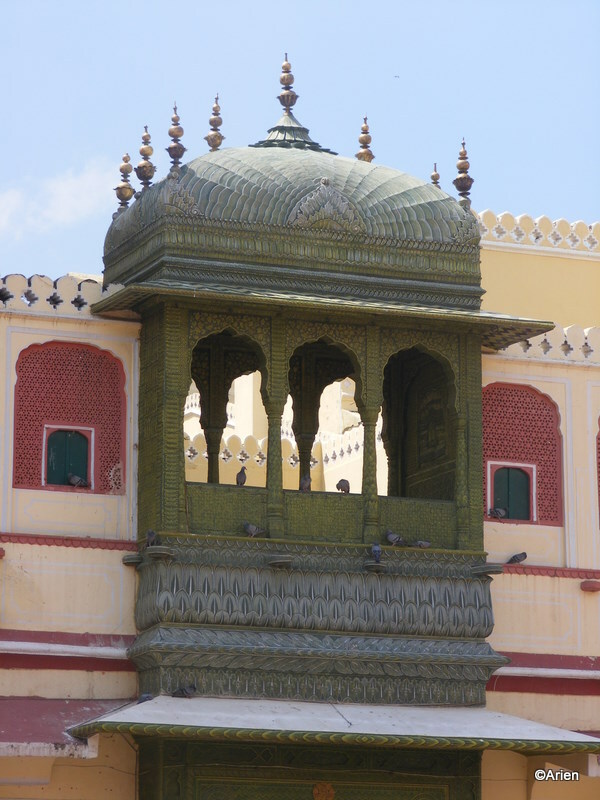 The guide showed us the Nahargarh Fort which he had visited yesterday. 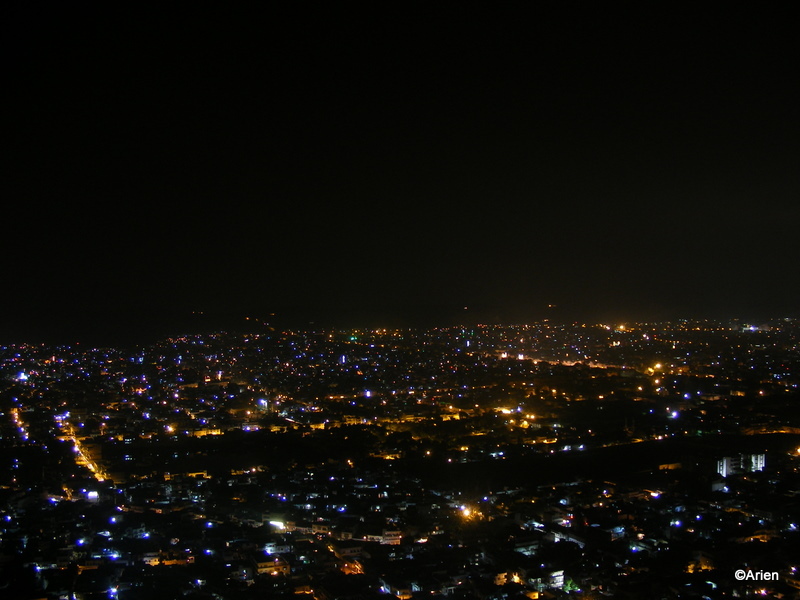 I took a great picture of the Arien against the Nahargarh Fort which he was unable to replicate. That bugged him a lot 🙂 He is known as the photographer in the family and so my fluke shot put him in a grumpy mood. We walked back via a different route, which was near the main entrance. The main entrance is known as the Sing Pol or Lion Gate. 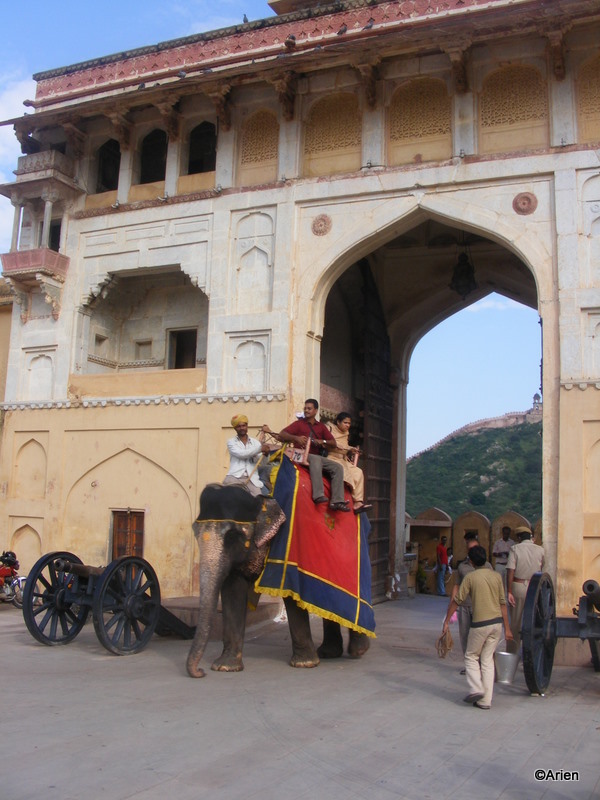 Most tourists come up on elephants and made a grand entrance. I wished we had done the same 😦 The Arien told me that we could have done that if we had left earlier. (Has not forgotten our delay in leaving the hotel.. Grrr!) Anyway, I decided to take a snap of the entrance and the tourist entry just to satisfy myself. 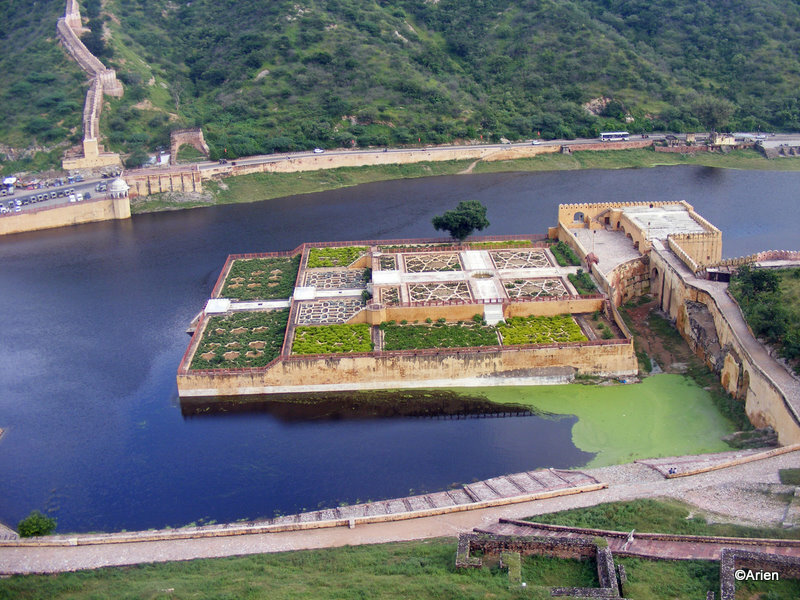 We saw the Maota lake and garden island from the Zenana in the Amer fort. It was dirty. There was green coloured discoloration on the lake and the Arien refused to take a snap of the lake. Finally, after a lot of cajoling, he took the picture and included the green mess 😦 I am including the picture here so you can judge for yourself if I am exaggerating. 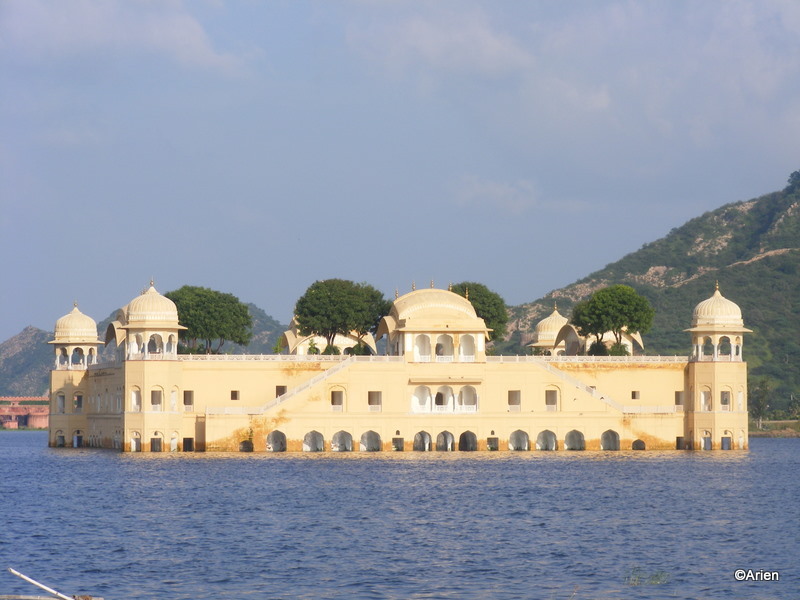 It felt like we spent an entire day here – but in actuality, we spent only a few hours at the Amber fort. But, the time was well-spent and we enjoyed every minute of it. Now, the Arien was hungry and we had to leave immediately. Anyway, we thanked the guide for his service and gave him a handsome tip. For once, he had a different expression – a smile 🙂 We walked back to the place where the rickshaw wallah had dropped us off. The Arien walked into the first restuarant we saw without signalling to our rickshaw wallah, to have a late lunch. It was ~5 pm. After a nice lunch – we felt re-energized and ready to continue with our sight-seeing. The next day dawned bright and sunny but we woke up late. Maybe it was the excitement of yesterday’s night drive or maybe it was the traffic jam during the journey from Delhi to Jaipur.. well, whatever it was, we were late. So, the bus plan and the taxi plan were guzzed. When a plan goes kaput, the Arien gets on the war path and so I opted for the rickshaw tour. I convinced him that tht was best option. The first place, we planned to visit was the City Palace. 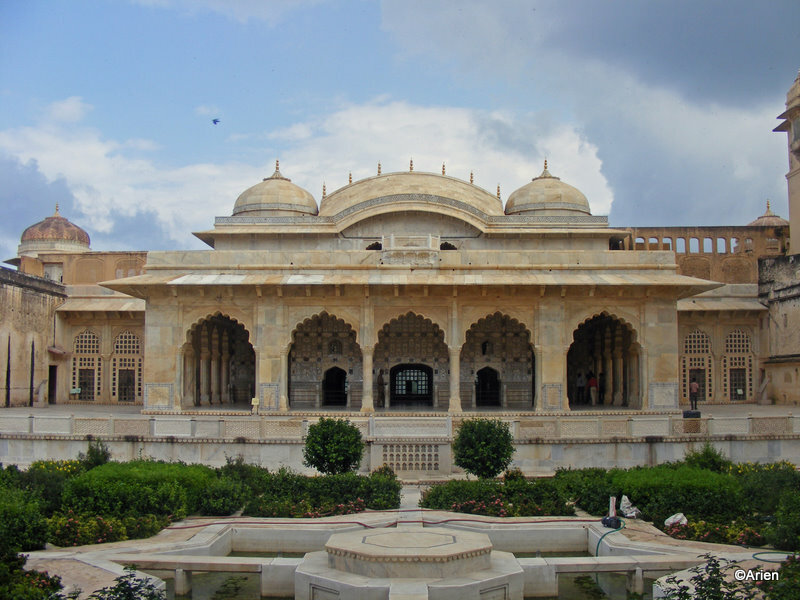 The city palace was supposedly built by Sawai Mansingh and was a true treat for photographers. Plus, it was a hot and sunny day. 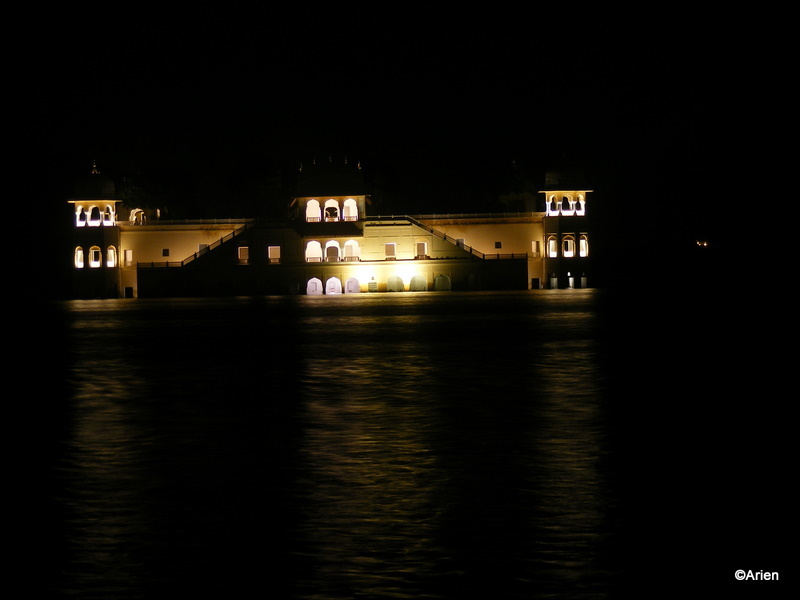 The first place we saw was the Mubarak Mahal. All the various outfits worn by the king, his wife were placed there and somehow they still managed to look royal and grand – though slightly long and huge for the king was a short man! Anyway, the Arien wandered away to shoot interesting snaps. 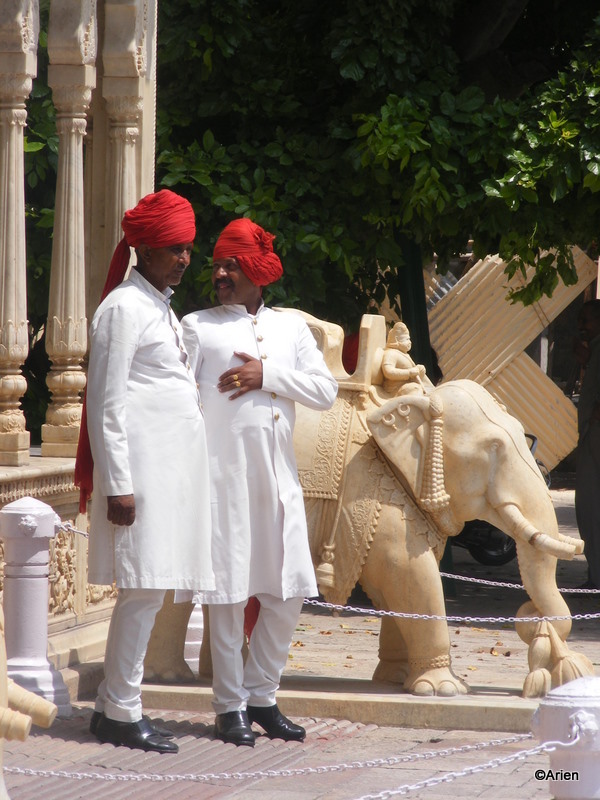 This snap of the guards in turbans, who were on a break, was a nice one. We moved towards the Entrance gates which had a typical arch. 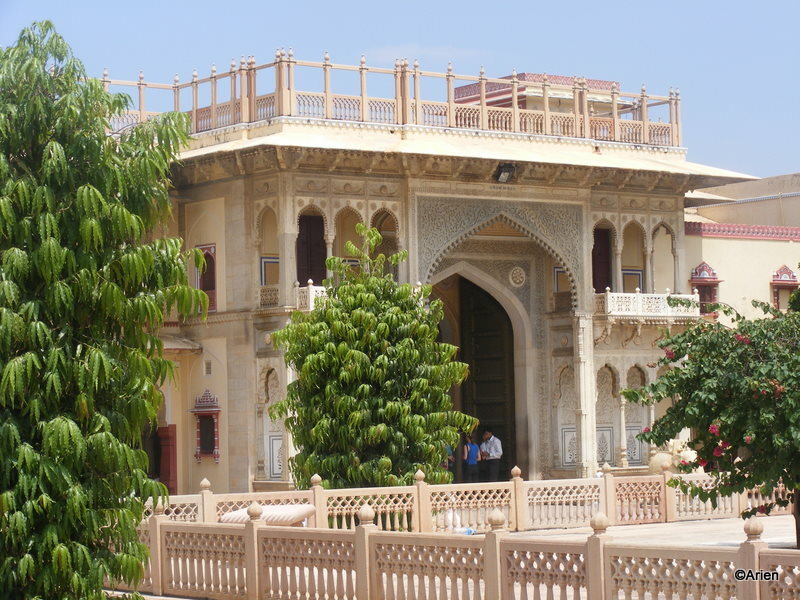 We were yet to see the Chandra Mahal or inside the palace. I had heard that they had maintained all the chairs etc. as is from those days. However, they did not let us take photographs inside and so we had to walk away without any snaps. We had not hired a guide or purchased the audio guide and so sometimes, we had no clue ’bout the monuments we were visiting, which was a shame. Anyway, we came across the rickshaw musem. We had seen the car and bike musem at Dharamshala but this was totally new. 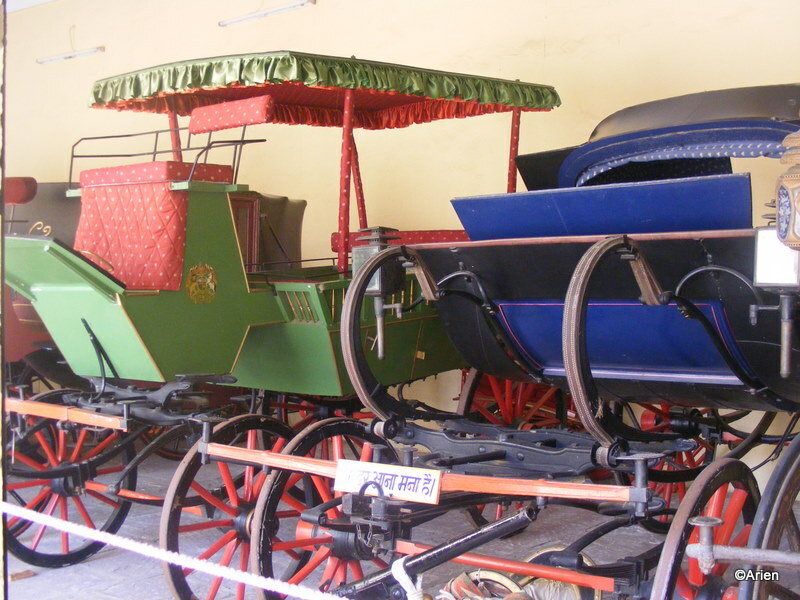 Some of them looked so spruced up and well-maintained, I felt that we could get on it and start touring the city. Of course, they were more the tonga type, so we may need a horse. It reminded me of the tonga ride that we had taken in Mysore, at dusk. I felt like we were under a spotlight. 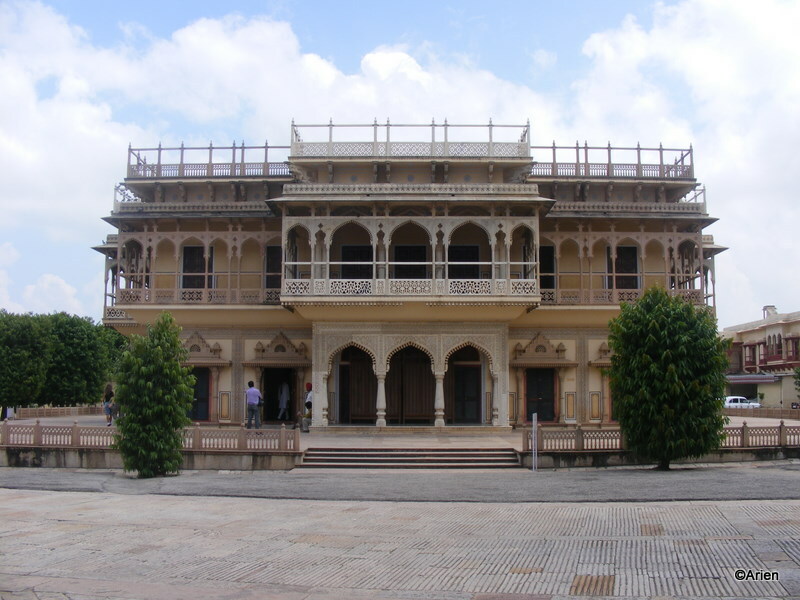 We took pictures of the Chandra Mahal. The flag on top is supposedly the flag of the royal family though it looks quite similar to the Indian Flag. We have no snaps of the Chandra Mahal from the front as we did not venture that way. Most of these palaces have gigantic gates and I have wondered if they always keep it closed. 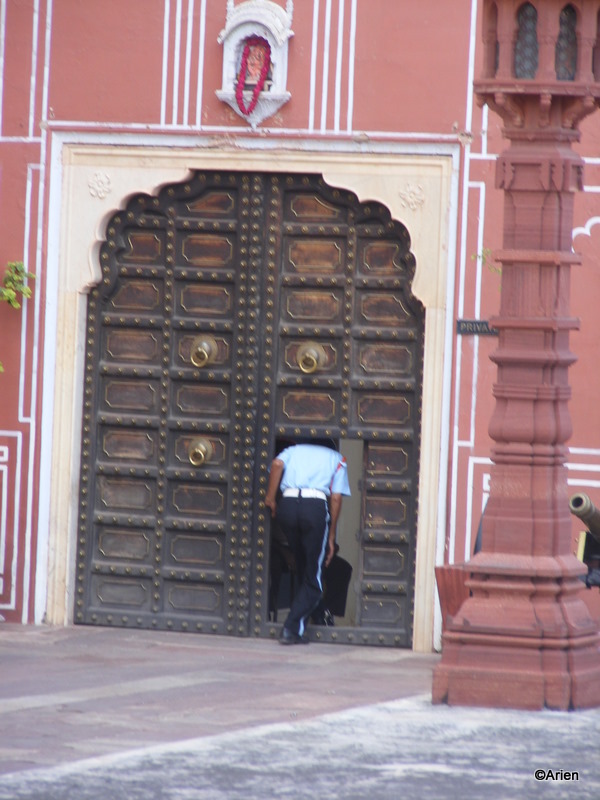 I noticed a lot of guards walking from a particular door though I hardly saw the gigantic door opened. It was while watching that that I noticed the smaller opening or door, carved into the gigantic gate for these occassions and I pointed it out to the Arien. We managed to take a shot of the guard as we walked out of the smaller door. Anyway, we came back to the exit gate, where our Rickshaw wallah had asked to wait. 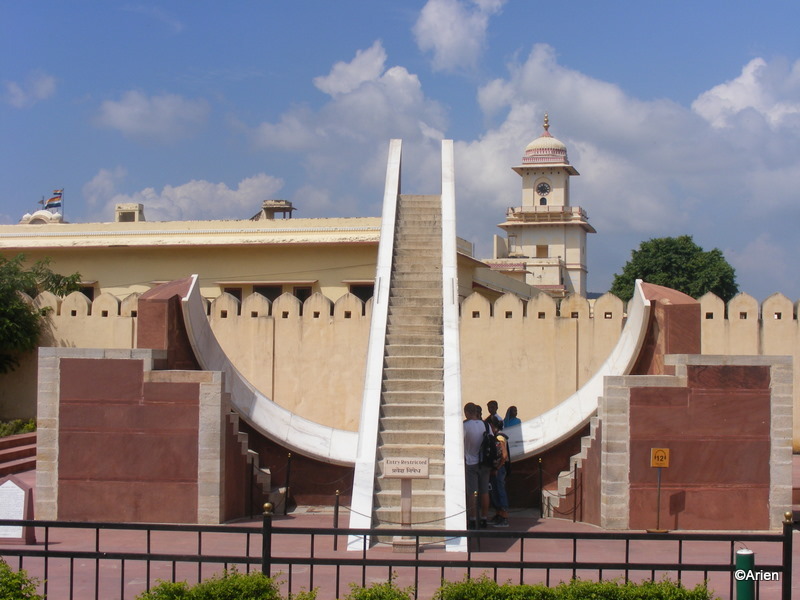 When we reached there he told us to visit the Jantar Mantar, which was nearby and mentioned that we need not purchase tickets again as our ticket was a 3-in-1. So, on this hot day, we moved to a place that was to me, quite boring. It was quite warm and there was not much shade and the Arien insisted on shooting pics. I moved away to pick up Maaza or Slice (a mango drink with no fizz) and the Arien asked me to pick up bottled water as well. So, while I was on these errands, he walked all round taking pics. I was dragging my feet and did not get back very quickly. He was soon bored. We had quite a few interesting places to visit and it was now lunch time but if we stopped for lunch, we would miss some of the sights and so we decided to get going. I think the rickshaw wallah was not too happy. Well.. cannot please everybody 😦 We still had to visit so many places. More on that in my next post.